Nintendo Announces Breath of the Wild Special Editions | Nerd Much? Well, if you wanted something to drool over when you finally get the Nintendo Switch, the company has announced The Legend of Zelda: Breath of the Wild Master Edition and a Special Edition. And by the gaming gods does it look good. 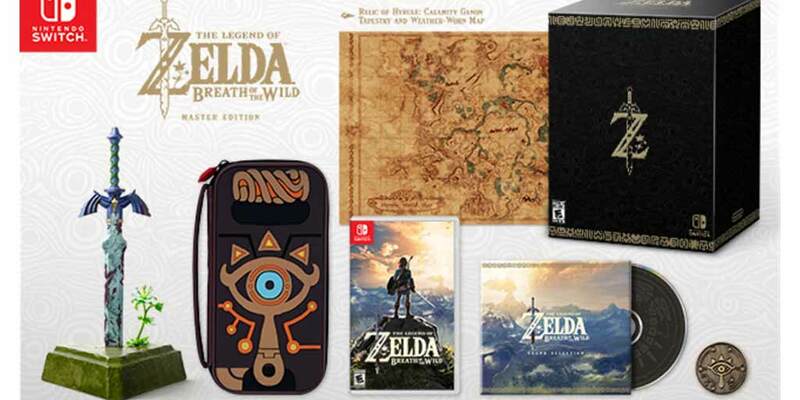 The Master Edition includes the game itself, a Master Sword of Resurrection figure, Nintendo Switch Sheikah Slate Carrying Case, Sheikah Eye Collectible Coin, Relic of Hyrule: Calamity Ganon Tapestry and Weather-Worn Map, and a Breath of the Wild Sound Selection CD. The Master Edition will cost $129.99. The Special Edition, for $30 less, includes all of the above save for the Master Sword figure. The game will be launched with the Switch on March 3, 2017 and is also available for the Wii U. Everything in these special editions is something a fan of Zelda will want to add to their collection. It looks like fairly good quality stuff and definitely worth it. The Master Sword especially because it’s rather rare to see the sword in it’s less shiny and brand new form. In addition to stellar looking case to protect your un-docked Switch when you’re out and about testing it’s battery life. Will you be getting one of the special editions? Which item is your favorite? Let us know in the comments below!